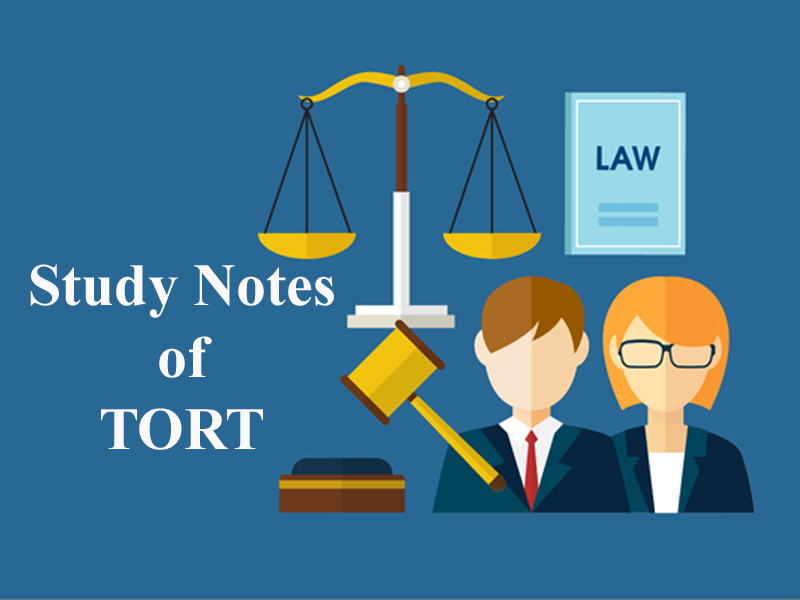 Here we are providing you updated and most relevant Study notes on Tort of Torts in Relation to Person for Law Entrance Exam. These study notes are highly recommendable for all those who aspire to crack CLAT, DULLB, AILET and other Law Entrance Exam. It may be committed negligently and intentionally. 1. Assault 2. Battery 3. Mayhem. 4. False Imprisonment. 1. Assault: - It is an act by the defendant that causes the claimant reasonable apprehension of infliction of intentional and direct application of force on him. Case Law : Stephens V. Myers. The plaintiff was the chairman of a parish meeting and on majority decided that defendant should be turned out upon this defendant said he would rather pull the chairman out of the chair than turned out of the room. Immediately he advanced fist clinched towards the plaintiff but was stopped. Defendant was held liable for assault. 2. Case Law : Blake V. Barnard Pointing a loaded pistol or gun at a person will fall under assault. A person can be liable even if he points unloaded pistol towards “B” as ‘B’ may not know that the pistol is unloaded. Assault becomes battery when there is intentional application of force against another without lawful justification. It is the actual application of force against another, done without lawful justification in angry, rude, insolent or revengeful manner. Case Law : Pratap Daj V. B.B. & C.L. Rly. The Plaintiff forgot to purchase the ticket and was forced to get down from the train the force used by the officials was lawfully justified hence no liability. Putting handcuffs to an under trail prisoner and chaining him like a dangerous animal with a neighboring window in a hospital is battery and the wrongdoer is liable. If a bodily injury is such whereby person is weekend in fighting or defending himself or to annoy his adversary then it is called mayhem cutting off a disabling or weakening man’s hand or finger or striking out of his eyes or fore tooth will be mayhem. It is another form of battery and includes all the ingredients of battery the only difference lies in the kind of Injuries. Not necessarily means prison/ jail, fallacious. It actually means total restraint or total confinement of man’s liberty whether it is in open field or on the street or in a house. Therefore it means wrongful restraint of a man’s liberty. 1. There must be total restraint on the liberty of the plaintiff. It is necessary that a person must be aware about his detention. For e.g. A man visited a jeweler’s showroom and on suspicion ‘A’ was asked to sit in waiting hall for filling of form and it was the trick followed/used by the jeweler to utilize the time till the police come for arrest later on it was found that the suspicion was wrong . ‘A’ filed a suit against jeweler and got the compensation. Case Law : Gauri Prasad V. Chartered Bank AIR 1925 Cal 1884. Plaintiff was arrested and was detained for an hour at police station Court held that plaintiff is innocent and had committed no offence. It was held by the court that detention was unjustified and therefore defendant liable. We know that false imprisonment means total restraint on the liberty of person and without lawful justification but where the – restraint is partial it does not amount to total restraint. Case Law : Bird V. Jones (1845) 7 QB 742 the defendant wrongfully enclosed part the public foot-way on a bridge, to view the boat race. The plaintiff insisted on passing along this part of the footpath and climbed over the fence. The defendant refused to let him go forward but told him that he might go back into the carriage way and cross the other side of the bridge if he wished. He refused to do so and remained there for 35 minutes. It was held that defendant is not liable. If a person did not know the means of Escape does it amount to false Imprisonment? Answer – If a person with ordinary prudence could know the means of Escape then it is not false Imprisonment than it will be considered as partial restraint. The Detention should be unlawful that means without any lawful Justification. A person was acquitted by the court in 1968 but was released from the Jail after 14 years in 1982, court granted rupees 35,000 as Interim Relief. Case Law : Bhim Singh V. J & K AIR 1986 SC 494 S.C. Considered it as malicious prosecution and granted exemplary damage to rupees 50,000. 2. Which of the following is a form of trespass to person? 4. A points an unloaded pistol towards “B”. Will A be liable for assault? 6. The Plaintiff forgot to purchase the ticket and was forced to get down from the train. Is this battery? 7. Does putting handcuffs to an under trail prisoner and chaining him like a dangerous animal with a neighbouring window in a hospital amount to battery? 9. Does partial restraint amount to false imprisonment? Get the updated and most relevant study notes on Torts in Relation to Person for upcoming CLAT and other Law Entrance Examination.